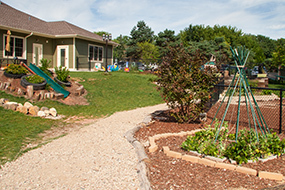 Nature’s Scholars Enrichment Center was designed to provide a comfortable “home-like” atmosphere. 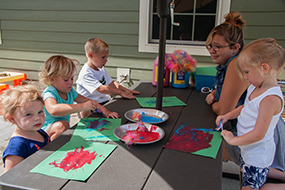 Using nature as our guide, calming colors, textures and lighting was all designed around the comfort of the children. Our professionals strive to provide an atmosphere that says, “come join us.” Every attempt is made to make the families feel welcome and secure, like part of a family... the Nature’s Scholars family. Children and family are warmly greeted, respected as individuals, and most of all ... loved. We especially hope to create an atmosphere where warm relationships exist now and beyond, between the children, teachers and their families. 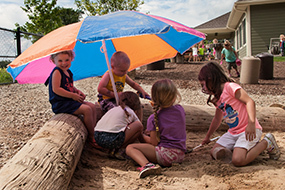 Our belief is that children learn best when they feel safe in a comfortable, loving and caring environment. An environment that promotes self identity and confidence to grow and develop at their own pace is as important as the individuals that work with the children. 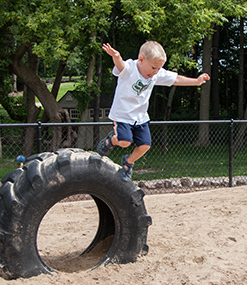 Evidence shows that contact with the outdoors, and especially with the natural environment, is important for children's development. Nature's Scholars wants to help children build a relationship with the natural world we live in. We are looking for a different type of feel on our playground. Life skills are learned by being exposed to situations and resolving them in a natural progression in life. Here at Nature's Scholars we teach the children about the importance of nutrition. 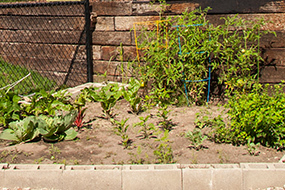 The children love tasting the food that they grow in our beautiful garden. Our sand surface is where the children love to use their social skills to work with their friends and dig deep holes and fill them with water. 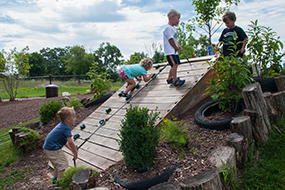 Our hillside is a fan favorite and during the summer the children love playing in our snap pea vine teepee. 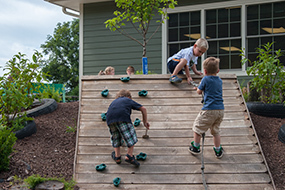 Children love using their large motor skills to climb our climbing wall over and over again. 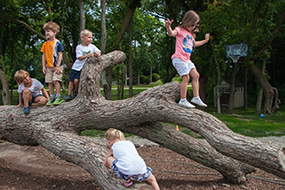 Our infants enjoy lounging in the swings on a nice summer day. Making goals are a necessity for children. One of the goals we encourage is learning to climb the climbing tree all by yourself and learning how to get down by yourself as well. 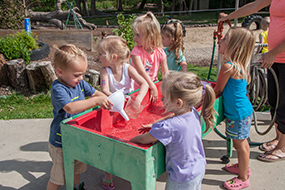 Keeping cool while socializing and enjoying the summer weather during sensory play. 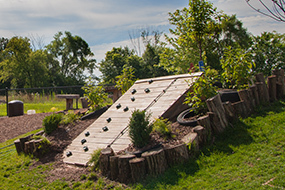 We love being outside so much we take almost every aspect of the classroom outside as much as we can. Sensory is important for development. 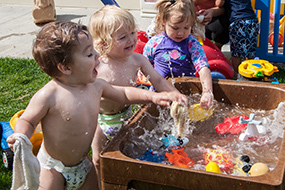 Our infants and toddlers love playing in the water. 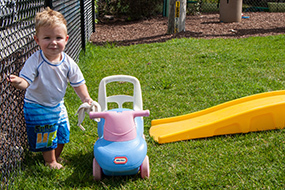 We also learn to take good care of our toys and to keep them clean. 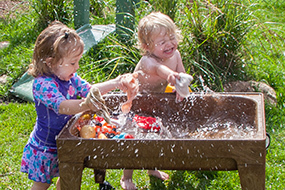 More fun sensory water play! Working together to help each other get up on our climbing wall is good social practice. Taking turns and learning to work together. Testing our physical boundaries in a safe way on our sand surface. 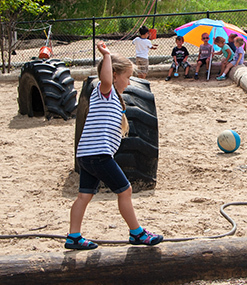 Learning to balance on one of our sand surface logs. Learning to socialize with our peers starts very early here at Nature's Scholars. 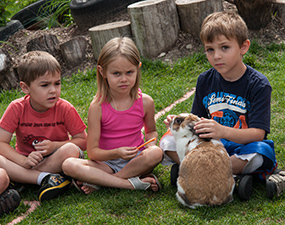 We teach the children how to take care of animals and treat them appropriately.